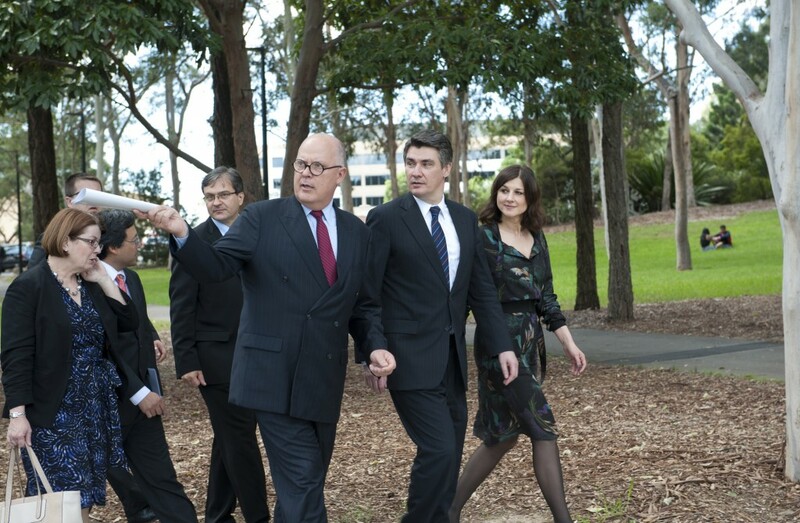 Macquarie University was pleased to welcome Croatian Prime Minister Mr Zoran Milanović to campus on Monday 10 March, as he recognised and offered ongoing support for the pioneering work of the only Croatian Studies centre in the Southern Hemisphere. Currently, Macquarie University teaches Croatian Studies to about 200 students, and since the unit’s inception 31 years ago, has had approximately 2,000 students. Chancellor The Hon Michael Egan AO and Vice-Chancellor Professor S Bruce Dowton were joined by other members of the University Council and Executive, to receive Mr Zoran Milanović, his wife Mrs Sanja Musić Milanović, and the Minister of Defence Mr Ante Kotromanović. Mr Zoran Milanović and his party of Croatian delegates were on site for the signing of a new agreement between the Republic of Croatia, the Croatian Studies Foundation, and the University, to continue support for teaching and research in Croatian Studies. As part of the agreement the Republic of Croatia will generously donate $150,000 per annum to Croatian Studies over the next five years, to the end of 2019. Chancellor The Hon Michael Egan AO said the support received from the Republic, the Foundation, and the Croatian community is of very great importance, and affords fantastic opportunities for students. “Later this year we will see a partnership between Croatian Studies and the University’s Department of Ancient History, which will take students and staff from Macquarie to undertake archaeological excavations in Dalmatia, to an area inhabited continuously since Neolithic times. Vice-Chancellor Professor S Bruce Dowton says the association reflects Macquarie University’s continuing commitment to connect Macquarie with the world.